He wears the standard Anvil guard uniform: a guard helmet, an Anvil cuirass and shield with chainmail gauntlets, greaves and boots. He is armed with a silver longsword and a fine steel bow with silver arrows. He carries the keys to the Anvil Castle interior and exterior. He also has a set of lower class clothing and a small amount of gold. 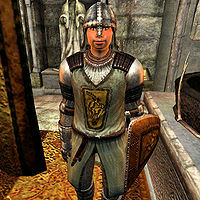 He wears the standard Bravil guard uniform: a guard helmet, a Bravil cuirass and shield with chainmail gauntlets, greaves and boots. He is armed with a silver longsword and a fine steel bow with silver arrows. He carries the keys to the Bravil Castle interior and exterior. He also has a set of lower class clothing and a small amount of gold. 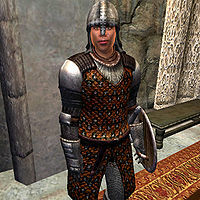 He wears the standard Bruma guard uniform: a guard helmet, a Bruma cuirass and shield with chainmail gauntlets, greaves and boots. He is armed with a silver longsword and a fine steel bow with silver arrows. 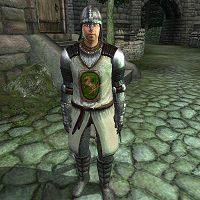 He carries the keys to the Bruma Castle interior and exterior. He also has a set of lower class clothing and a small amount of gold. 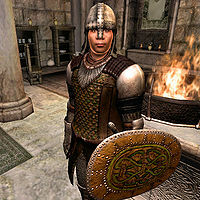 He wears the standard Cheydinhal guard uniform: a guard helmet, a Cheydinhal cuirass and shield with chainmail gauntlets, greaves and boots. He is armed with a silver longsword and a fine steel bow with silver arrows. He carries the keys to the Cheydinhal Castle interior and exterior. He also has a set of lower class clothing and a small amount of gold. 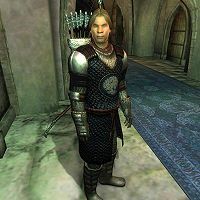 He is removed from the Corrupt Cheydinhal Guards faction at the end of the Corruption and Conscience quest. 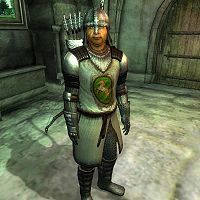 He wears the Chorrol guard uniform: a Chorrol cuirass with chainmail gauntlets, greaves and boots. He is armed with a silver longsword and a fine steel bow with silver arrows. 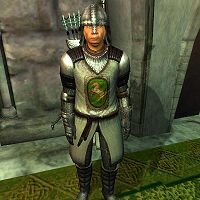 He carries the key to the Chorrol Castle private area and a copy of the Countess' key. He also has a set of lower class clothing and a small amount of gold. 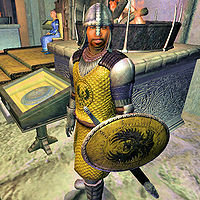 He wears the Leyawiin guard uniform: a guard helmet, a Leyawiin cuirass with chainmail gauntlets, greaves, and boots. He is armed with a silver longsword. He carries a torch, the key to the Cheydinhal Castle exterior, the barracks key, and the key to the Coast Guard Station. He also has a set of lower class clothing and a small amount of gold. When he commits suicide his suicide note will be on his corpse, which can be found at the Leyawiin City Watch Barracks. Unlike the other bodyguards he will sleep at 4am for two hours. He wears the standard Leyawiin guard uniform: a guard helmet, a Leyawiin cuirass and shield with chainmail gauntlets, greaves and boots. He is armed with a silver longsword and a fine steel bow with silver arrows. He carries the keys to the Leyawiin Castle interior and exterior. He also has a set of lower class clothing and a small amount of gold. He wears the standard Leyawiin guard uniform: a guard helmet, a Leyawiin cuirass and shield with chainmail gauntlets, greaves and boots. He is armed with a silver longsword and a fine steel bow with silver arrows. He carries the keys to the Leyawiin Castle interior and exterior and the barracks. He also has a set of lower class clothing and a small amount of gold. This page was last modified on 23 January 2015, at 20:58.